Blue Steel Handcuffs are manufactured from top-of-the line carbon steel. Heat-treated internal lockworks, smooth ratchets for quick cuffing and double locks thwart tampering attempts. Blued finish deflects glare and hides scratches. 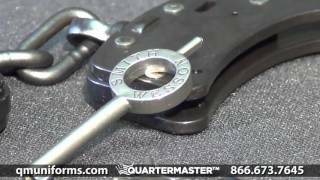 Each and every Smith & Wesson® Handcuff is made in the USA and meets NIJ standards for strength, craftsmanship and corrosion resistance. Inner perimeter range of 5¾" - 8"
Very nice pair of hand cuffs.Easy to double lock. I have had these cuffs for about 6 years now. I have never had an issue with them. However, the people that I put them on all say they are too tight. I tell them they are not meant for comfort :). Anyway I am going to buy a pink pair today for the real uncooperative ones. Its the only brand I will buy. Cuffs look and feel sturdy, individually serialized, and include full lock option. Came out of box heavily oiled, need to wipe down first.